Oxygen is constantly entering and leaving water, but there is always a certain amount of oxygen in water because water has a natural attraction to oxygen. When oxygen comes in contact with the surface of water, the oxygen tends to enter the water, becoming dissolved oxygen (DO). The amount of attraction between oxygen and water depends on the amount of oxygen already in the water. If there is very little oxygen in water, then the water is very attractive to oxygen. But when water has a high concentration of DO, then the water is saturated, meaning that the water contains as much oxygen as it can hold. 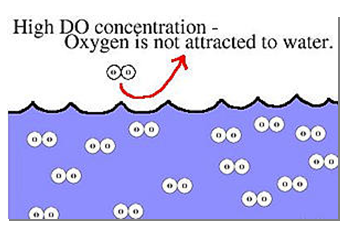 Saturated water is not very attractive to oxygen. 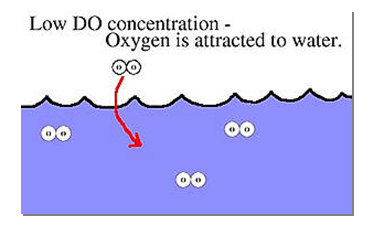 Water’s attractiveness to oxygen also depends on the concentration of oxygen in the air coming in contact with the water. The higher the concentration of oxygen in the air, the greater the attraction of the oxygen is to the water. You can think of an oxygen molecule as a person who likes to live far away from other people. If this person is looking for a place to live, he or she will move into the area with the lowest population. Oxygen molecules do the same thing. If the air is crowded with oxygen but the water is not, the oxygen will move into the water. If the water is crowded with oxygen but the air is not, then the oxygen will move into the air. The greater the difference between the oxygen concentration in the air and the dissolved oxygen concentration in the water, the faster the oxygen will move into the water. So if there is very little oxygen in the water, oxygen will dissolve into the water very quickly. This process of oxygen moving from an area with a high oxygen concentration to an area with a low oxygen concentration is known as diffusion. Concentration of oxygen in the air and water are not the only factors that determine how much oxygen will be dissolved in water. The amount of surface area between the water and air and the water temperature will also determine the rate of oxygen exchange. A larger surface area, as when water runs over rocks in rapids, will allow more oxygen to enter the water. Additionally, cooler water has a higher saturation rate than warmer water, which allows it to hold more oxygen. It is important to understand the transfer of oxygen between air and water and what factors can cause oxygen to be more attracted to one more than the other. Understanding this will also help in fully understanding the water treatment process. This entry was posted in Educational Tools, Tim Ricketts and tagged Dissolved Oxygen, drinking water, wastewater. Bookmark the permalink.